inspired by the needs and wishes of individual musicians worldwide. 개개인의 취향과 요구 사항은 그야말로 너무 다양합니다. 폭 넓고 다양한 범위의 현을 즐겁게 개발, 제작하고 있습니다. with a character not yet found in our product family. and carrying power combined with a precisely focused sound projection. The clarity of its sound, however, does not diminish the abundance of colours Perpetual offers. 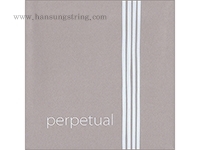 Perpetual's sound qualities from extreme fortissimo to the most sensitive whisper. 퍼페츄얼의 개발은 우리의 제품군에서 찾을 수 없었던 캐릭터를 가진 현 세트를 만들어 냈습니다. 정확하게 초점이 맞춰진 사운드 프로젝션을 갖춘 전달력을 제공합니다. 그러나, 사운드가 선명하다고 해서 퍼페츄얼이 제공하는 컬러의 풍부함이 감소하지는 않습니다. 퍼페츄얼의 사운드 퀄리티를 매끈하게 보완합니다. during legato, shifting, string crossings, double stops and chords. 덕분에 뮤지션은 가장 넓은 범위의 역동성과 표현력을 가지고 연주할 수 있습니다. 퍼페츄얼의 확장된 잔향은 활기 넘치는 빛을 만들어 냅니다. 엄청난 튜닝 안정성은 악기에 줄을 거는 즉시 실현됩니다. while the stronger 0.267 mm E provides a slightly darker, more voluminous tone. Both E-strings are equipped with a removable ball end. 퍼페츄얼 세트의 또 다른 진전은 0.26 mm와 0.267 mm가 제공되는 플래티넘(백금) 도금 E현입니다. 반면에 더 강한 0.267 mm E는 살짝 더 어둡고, 더 풍부한 음색을 제공합니다. 두 E현 모두 탈부착이 가능한 볼 엔드를 갖추고 있습니다. 스탠다드 세트는 0.26 mm E현과 함께 합성 코어 G현, D현, A현을 포함합니다.